In a large bowl, whisk the flour, cocoa, baking powder, baking soda and salt. Add the diced avocado in a blender and process until smooth. Add the milk, honey, olive oil, vanilla extract and process until well blended and creamy. Pour the avocado-olive mixture into the flour mixture and whisk until blended. Scoop spoonfuls of batter into a lined 12 cup muffin tray. Bake for 25 minutes or until a tooth pick inserted in the center comes out almost clean with only a few attached crumbs. Remove from oven and set aside to cool. To prepare the avocado glaze, process the diced avocado, honey, salt and vanilla extract in a blender until smooth. Pour in the melted chocolate and process until smooth. Pour glaze into a small bowl and dip cupcake tops in it. Serve. 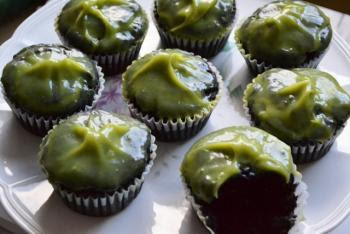 0 Response to "Avocado, Chocolate & Olive Oil Cupcakes w/ Avo Glaze"